Merriam-Webster defines demagogue as “a leader who makes use of popular prejudices and false claims and promises in order to gain power.” Historically, engaging in demagogy—or, more to the point, being perceived as doing such—is one of the surest tickets to inciting controversy. Some of the 20th century’s most power-hungry figures have been tagged as demagogues, including Benito Mussolini and Adolf Hitler. American leaders are not immune from the label. In the 1930s, Democratic Senator Huey Long of Louisiana, a challenger to President Franklin Roosevelt for the party nomination, faced accusations that his “Every Man a King” populist platform was intended to lure impoverished voters with false promises . Two decades later Senator Joseph McCarthy of Wisconsin, a Republican, was charged with demagogy for conducting a protracted anticommunist “witch hunt” within Hollywood and the federal government. Eugene Talmadge was a conflict-ridden figure throughout his career in Georgia politics. Elected the state’s Agriculture Commissioner in 1926, he was criticized by the State Senate for improperly spending departmental funds on trips to the Kentucky Derby. When openly accused of stealing $20,000, Talmadge famously assured one group of farmers that “Sure I stole it! But I stole it for you.” He capitalized on his rural popularity (once claiming he could “carry any county that ain’t got street cars”) in the 1932 gubernatorial election, winning in part due to the county unit system in place at the time which overrepresented rural votes at the expense of urban areas. 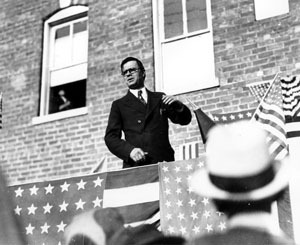 Below: Eugene Talmadge on the podium, 1936. Herman E. Talmadge Collection, Russell Library. As governor, he proved polarizing for his “dictatorial” executive orders and racially tinged attacks on Roosevelt’s New Deal relief programs, which some white Southerners saw as disproportionately aiding blacks. After Huey Long’s assassination in 1935, Talmadge weighed a potential run against Roosevelt but chose instead to wage a battle against incumbent Senator Richard Russell for the Democratic nomination; Russell won handily. Talmadge lost another U.S. Senate primary in 1938 to incumbent Walter George. 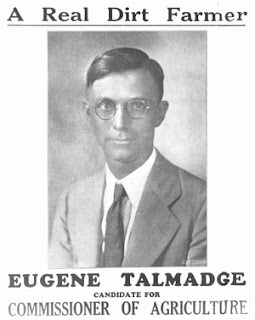 But it was in Talmadge’s second tenure as Governor from 1940 to 1942 that he engaged in his most demagogic tactics. A University of Georgia alumnus, he sought to purge the University of any politically left-aligned, “foreign,” or racially tolerant elements. Talmadge called for the Board of Regents to remove Dean Walter Cocking, who was rumored to sympathize with the cause of desegregation. When the board refused, Talmadge himself fired Cocking along with all board members who had opposed the removal. All Georgia’s universities lost their accreditation as a result, their credibility shattered by such direct government interference in academic affairs. Right: On the stump for the last time, Talmadge campaigning for Governor in 1946. Herman E. Talmadge Collection, Russell Library. What came to be known as “the Cocking Affair” led to Talmadge’s defeat in the 1942 Democratic primary, at the hands of more liberal candidate, Ellis Arnall. Campaigning mostly on the single issue of restoring whites-only primary elections, Talmadge returned to the office in 1946, despite losing the statewide popular vote to Arnall-endorsed candidate Jimmy Carmichael. Talmadge died in December of that year, precipitating a long succession controversy and marking the end of an eventful and deeply divisive electoral career.